The Host of Heaven is an angelic society encompassing all angels except those that rebel or fall from Heaven. Little is known of how this particular society functions. Activities of angels within the Host vary. 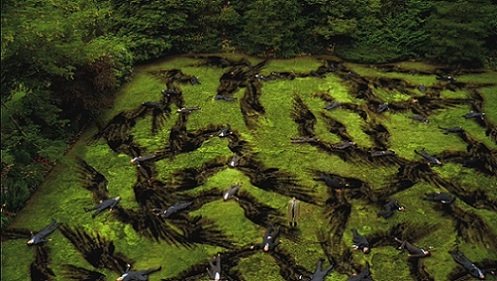 The Host of Heaven is arranged into a rigid, militaristic hierarchy. Angel garrisons are divisions in Heaven, inhabited by certain angels. Anna, Castiel and Uriel were originally part of an angel garrison led initially by Anna. Questioning or refusing to follow orders can lead to severe punishments, which may involve diminishing an angel's stature inside the Host. In extreme cases, an angel may be hunted and killed for their trespasses, including lack of faith and choosing to fall. Both Anna and Castiel are tortured for their disobedience. Now, this arrangement has been breaking down since God's departure from Heaven and around the rebellion of Lucifer. When God left Heaven, Michael adopted full responsibility in leading the Host, maintaining order and stability within it. Castiel kills the angels who supported Raphael. Angels within the Host were not created all at once; the archangels were created first by God out of pure primordial creation. Before the Apocalypse, the archangels were the only known four angels to have seen God. The angels of Heaven are not indestructible, and the entire Heavenly establishment could be obliterated by one word from a cambion. Uriel was at one time leading a group of Lucifer loyalists to free the fallen angel. Castiel chose to side with the Winchesters, and his rebellion causes him to be cut off from Heaven. Following the imprisonment of Michael in Lucifer's Cage, Raphael wished to assume control, and restart the Apocalypse. Castiel opposes him and makes a deal with Crowley to locate Purgatory and access the souls there as a source of power to use against Raphael. He also acquires angelic weapons stolen by the angel Balthazar. After taking on the souls of Purgatory, Castiel kills Raphael and the angels loyal to him. He becomes the leader of Heaven temporarily, but is unable to contain the power permanently. The angelic Host of Heaven's numbers are not unlimited, and have been prone to internal conflicts. The Heavenly ranks have been decimated through years of battles from defending the 66 Seals and the Apocalypse to the First Angelic Civil War, the Fall and the Second Angelic Civil War on Earth. These various conflicts have dwindle the angelic ranks, leaving, as of 2018 their numbers to only 9 angels in existence, led by Naomi. With so few angels alive to maintain Heaven, the strain will eventually burn the remaining angels out, causing Heaven to power down and crumble, releasing all the souls in Heaven on to the Earth. The Cosmic Entity who is enraged when Jack dies and goes to Heaven rather than The Empty, threatens to destroy Heaven until Castiel makes a deal to save Jack in exchange for his own life. For more information, see Angel Lore. 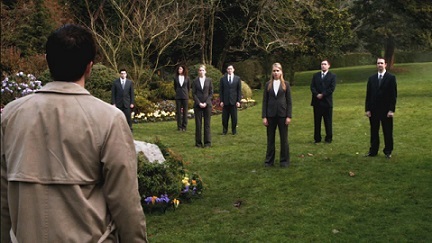 In seasons four and five, the leaders in the Host might loosely be defined as those who were aware of the plan to allow the 66 Seals to break, which would release Lucifer, and sought to hasten his battle with Michael in order to bring forth paradise. These angels issue commands, promote and demote subordinates, and may be involved in the selection of prophets. In Season six, leadership and management in the Host is in some doubt as the angels are in a state of civil war. The combatants consist of Raphael and his followers, who wish to restart the Apocalypse, and Castiel and the other angels that oppose this plan. Michael, after God left Heaven, became the primary authority there, managing and maintaining the Host by issuing commands to angel garrisons. Soon after his imprisonment in the Cage alongside Lucifer, Heaven's management is falling into major disorder, splitting up the divisions in the Host. Raphael was an important member of the Host who may have guarded the prophet Chuck Shurley. He seems to hold authority and leadership over other angels. Following Michael's imprisonment in the Cage, he starts searching for God's weapons so that he can release Michael and Lucifer, giving Michael a final opportunity to kill Lucifer. Zachariah answered to Michael and Raphael. According to him, he has been working for Heaven for over 6 millennia. Prior to his constant failures to obtain Dean's consent for Michael, he was respected for his achievements. In 5.18 Point of No Return, Michael terminated his position in the Host but later gave him a final opportunity to secure Dean. Naomi is the head of the Intelligence Division in Heaven, and one of the major players in the ongoing power struggle to gain control. She attempts to have Castiel spy on the Winchesters by controlling his mind with her drill, but he is reset to his factory settings when he touches the angel tablet. It is implied that she had a past fling with Crowley. Castiel meets with angels in Heaven after the Apocalypse is averted. These angels might be referred to as those that did not know about the plan to support the Apocalypse and fought to save the seals, or those who had no active role to play in support or opposition to the plan. Some of them are grouped into angel garrisons during seasons four and five. After the defeat of Lucifer and Michael, the host members split. Some supported Raphael's effort to restart the Apocalypse, and others oppose his actions. Castiel was a soldier in the Host. At first he directed most of his efforts towards following orders, and did have a command role. However over time he develops empathy for humans, in particular Dean and Sam Winchester. His superiors demote him as a result, and when he begins to disobey they return him to Heaven for punishment to ensure he remains obedient. He sacrifices his position in the Host to help Dean try to stop the Apocalypse. He dies twice, and is resurrected both times by God. After his second return, he is given enhanced angelic powers. He then returns to Heaven to help restore order to the Host. In season six, he fights in opposition to Raphael. He defeats the archangel by taking in souls from Purgatory, and declares himself the new "God," and leader of Heaven. His reign is short lived, as the souls he absorbed began to erode his vessel, forcing him to give them up. He chooses not to return to Heaven, as a form of atonement for the various mistakes he's made. Joshua, is an angel who talks with God, although they don't converse face to face. Joshua is the keeper and guardian of Eden; he says some refer to it as "God's Throne Room." He is referred to as a gardener. Uriel is first introduced as being a "specialist" under Castiel's command. He is promoted over Castiel when the latter is perceived to be getting to close to humanity. Uriel finally reveals that he supports the rise of Lucifer - not so that Michael can defeat him, but so that the angels may follow Lucifer. Uriel made many attempts to persuade the angels in his garrison (including Castiel) to join his cause. Cas refused, and attacks the other angel. Uriel gets the upper hand, but is prevented from slaying Cas when Anna appears and kills him with an angel blade. Virgil is an angel who protected and managed God's weapons in Heaven as an occupation. Following shortly after the disappearance of the weapons, Raphael deploys him to retrieve them, he takes a vessel and locates the Winchesters but is eventually left trapped inside the alternate Earth reality. Cherubs represent a lower order of angels colloquially called "Cupids" which are ranked as third class angels. They are weaker than angels and archangels, but have other unique powers, such as the ability to bring the most opposite of people together through love manipulation. Rachel was Castiel's lieutenant and a close friend. During the angelic civil war between Castiel and Raphael's factions, she was killed by Castiel, after confronting him about the rumors that he was working with Crowley. Hester served under Castiel. After his disappearance she remained at her post, disillusioned. She attempted to kill Castiel when he remerged with the prophet Kevin Tran, but was quickly killed by the demon Meg before she could deliver the killing blow. Inias also served under Castiel. Following Hester's death, he assumes command of at least some of the angels. Samandriel first appeared during an auction held by the god Plutus, he was there in hopes of purchasing the demon tablet for the Host of Heaven. At some point he is captured by Crowley and tortured into giving him the names of all the potential prophets of the current generation. While being tortured, he also reveals that there is a angel tablet to Crowley. Ion had become disillusioned by his time working under Naomi in intelligence, remarking to Castiel of all the brain washing and mind wiping the angels had gone through, and how the soldiers were lucky they were able to "believe in the lie," while he was forced to remember many of things he had done, because of his job. It's that disillusionment that leads to do freelance work for Crowley, because to him nothing mattered anymore. Castiel eventually kills Ion by shoving the melted down angel blade Crowley had shot into him, through Ion's eye. Esper was one of Naomi's foot solders, who was task with Ion to track down Castiel and the angel tablet. He is shot and killed by Crowley, who had melted down an angel blade into bullets. Nathaniel is one of Naomi's underlings. The angels below left the Host for different reason. See Fallen Angels for more details. Lucifer was an executive member of the Host. Soon after God created humans, he was banished for disobeying His orders, and soon locked away in his Cage for twisting a human soul into the first demon, who became known as Lilith. Gabriel was an executive member of the Host. Soon after the start of hostilities between Lucifer and Heaven, he left and fled to Earth and concelaed his identity by discuising himself as Loki. Metatron was the Scribe of God, who left Heaven when he found out the archangels plans to take over the universe in the absence of God. He relocated to Earth where he took refuge with a Native Americans, called the Two Rivers tribe in Colorado. In exchange for stories he gave them protection and longevity. He was cut off from Heaven until 2013, when he met Sam and Dean Winchester, as well as Castiel, and began his revenge against the angels. Anna Milton was an active member on the Host. She began longing for independence, so she decided to fall to Earth. She removed her grace and turned human. Anna was a superior of Castiel and Uriel. Balthazar was previously a member of the Host, and a friend of Castiel. Once the Apocalypse was averted he left Heaven for Earth, and proceeded to live a hedonistic lifestyle. He seemed to be the only angel to embrace the new found freewill the angel had received.